After a series of strange events, Silas Ainsley realizes that he is not a normal seventeen-year-old. In his journey to escape from two mysterious headhunters, Silas discovers his life and death are key to saving an entire world, called Marenon, from darkness and destruction. The only way to get to Marenon is to die, and Silas has just arrived. Author Jason D. Morrow asked me to read his new fantasy novel back around Christmas time and after being shipped a paperback novel towards the new year I could not wait to dive into this book. The Deliverer is not at all what I thought it would be which in my case is good and bad. I am very my into the genre of the urban fantasy novels and I had believed that The Deliverer would be somewhat of this type but it was far from it. This is not necessarily a bad thing but not good. 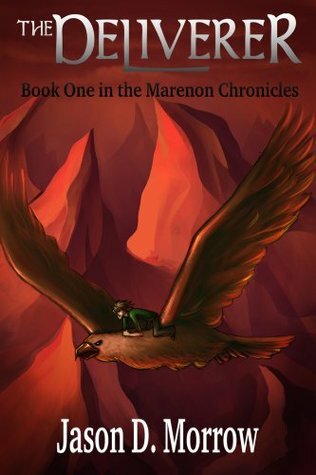 The story does begin on earth in this day and age but then because of a series of events takes a rapid jolt into another world of pure fantasy with magic, flying birds, hell hounds, and the element of the unknown lurking around every corner. While reading I found myself thinking that this book had a Lord of the Rings type of feel to it which is not a bad thing but was just not my cup of tea. I will say the story-line was extremely evolved and well planned out with a very interesting plot. The character's are all very likable and can be related with at points in the book. Silas who is the main character is a strong male lead with such charismatic traits. A very good leader. I did however find the book's pace to be somewhat slow and the sentence spacing being one space rather than two. I know for me it makes a the book slower to read having more on each page. I did so however feel the author put a lot of hard work and research into his book. The places and event that take places where all so very well written and thought out. I highly enjoyed how in some area's in the story I could almost see myself there beside Silas by how descriptive the author was in writing those scenes. I would definitely recommend this book to someone who enjoy a fantasy novel. There was not to much romance in the first book. I would read the second one just to be able to find out what happens next. I feel the lack of romance did bring The Deliverer down a star rating, but that's just by opinion. Other than that it was a fun read with highly entertaining plot leaving the reader wanting to know what will happen in the next book. So if your looking for a book with a lot of fight scenes, mystery and packed with fantasy - The Deliverer by Jason D. Morrow is the perfect read.